Watching Amy’s tutorial on Pumpkin Challah motivated me to get in the kitchen and make yeast bread. And while the Pumpkin Challah is still on the agenda, I was sidetracked by something called Garlic Monkey Bread, which I’d never made but had always been curious about having seen a million variations of it in old Bake-Off cookbooks. 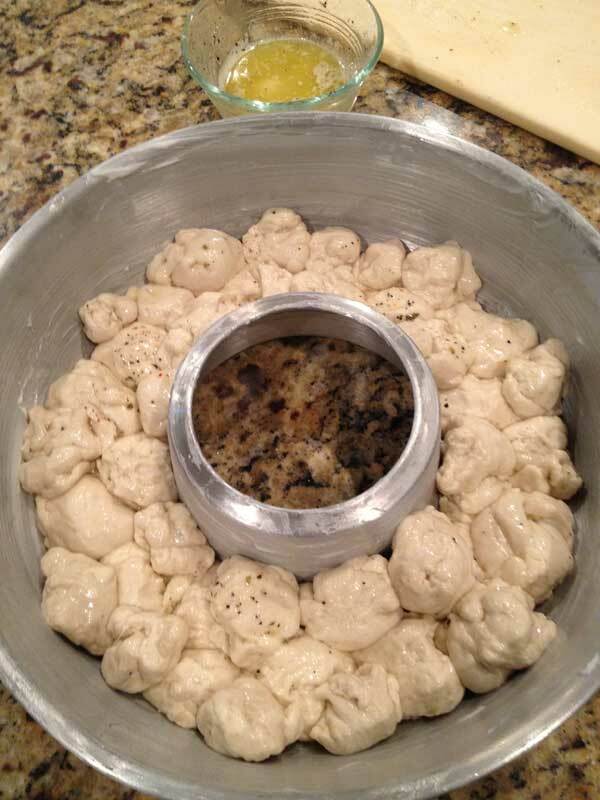 Monkey bread is composed of little balls of dough all stuck together and baked. Made in a cake pan or ring pan, the result is a pretty loaf that can be easily pulled apart by gangs of monkeys. Or at least that’s what I imagined until I went to Wikipedia and saw that it was probably named for a tree. I like the “torn apart by monkeys” theory a little better. Or maybe it’s called Monkey Bread because it’s so easy a monkey could make it? Several versions are made with canned biscuit dough, canned cinnamon roll dough or frozen dough. After making this scratch version, which is savory (many versions are sweet and more suited for breakfast), I’m looking forward to trying one of the convenience recipes — one where I don’t have to worry about killing any yeast or pulling out my stand mixer with the dough hook. Despite the fact this one’s from scratch, it’s still fairly simple and I recommend it for those of you who like to make yeast breads. For everyone else, I found another version on Food.com that uses packaged bread dough. Whichever version you go with, don’t be surprised if you pull it out of the oven and it gets attacked by a gang of monkeys. As a side note, whichever version you make, you might want to consider serving it with Slow Cooker Beef Stew. It’s a bit sweet and not too acid-y or salty tasting. Plus it’s made in a slow cooker, so you can make it early in the day and forget about it while you focus on the bread. You’ll probably have to sign in to Better Recipes to view it, though. Hi Jennifer, I’ll bet the convenience version of monkey bread is as good as the scratch version. The beef stew is in my slow cooker right now and I’m going to make a convenience version of the monkey bread (due to a school event at 7:00 and only an hour to get dinner on the table after work.) Thanks for the great dinner ideas! Monkey Bread was Helen Corbitt’s hit contribution to the opening of The Mariposa restaurant, when Neiman Marcus opened at the Houston Galleria in 1967. Her’s is a savory recipe. Sue, thanks for the review! We had the monkey bread again tonight. Since there are only 3 of us, I divided the loaf into three sections and froze two. We have one more section left. I made this and the stew you recommended, both were tasty and appreciated. I will definitely make both again. BTW, I made the stew without the sugar. When you mentioned the sweetness I thought we’d like it better without the brown sugar. It’s been years since I’ve made Monkey Bread! I usually make the sweet/caramel kind but love the savory ones too. I used to make them the night before and let it rise overnight and just pop in the oven in the morning. This looks delicious! Thanks for the mention, Anna! 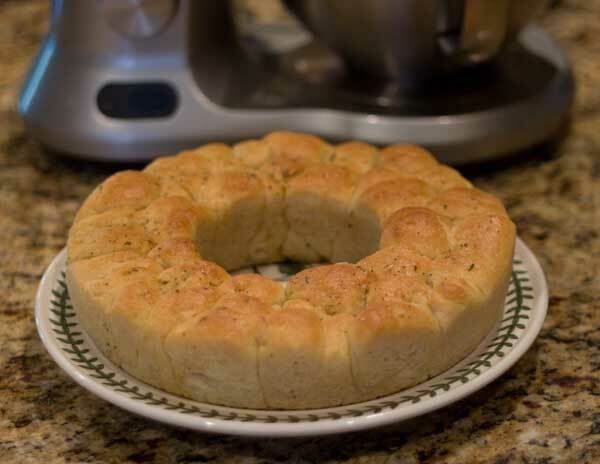 This looks good- I had only seen sweet monkey bread before so a savory version would be fun! Darlene, I vaguely remember hearing about the gingersnap trick, but have never tried it. Sounds like a fun recipe for fall! We really did like the Better Recipes stew recipe, though. I made it exactly as written, but threw in about 1/3 cup of leftover red wine. Thanks for the heads up on the Slow Cooker Beef Stew, it’d be perfect to come home to after our high school’s football game tomorrow. I’ve made a beef stew recipe for years that suggests throwing in a few crumbled Ginger Snap cookies toward the end of the cooking time. They dissolve quickly and give a slightly sweet/spicy taste to the dish (although you’d never guess that there were Ginger Snaps in it). Sue, I’m guessing it’s more popular in the midwestern and northeastern regions of the US. I’d never heard of it until I was an adult. I haven’t thought about Monkey Bread in a long time. We used to make this when I was in highschool with frozen bread dough.